A wave of the left in Kerala has caught many people by surprise. Perhaps, ten days before the state assembly elections, nobody could predict that the people of Kerala would express such major support to LDF in this manner, though the possible success was predicted by many. What was more welcome was also the list of promises which the LDF placed before the voters during its election campaigns. Is the LDF trying to break its election promises within 24 hours of swearing in? Among the promises of the left, at least three promises have had a major positive impact on the minds of many voters. Those promises are: 1. Development Without Destruction of Environment, 2. Development without Harming People, and 3, Governance Without Corruption. Is the LDF trying to break its election promises within one day of its swearing in? 1. Vizhinjam Transit Harbour will destroy two hills from the Western Ghats (One from Kerala and another from Tamil Nadu). Is this the concept of `Development Without Destroying the Environment’, the election promise articulated by LDF? 2. Has Ramachndran Kadannappalli discussed with the local people and the environmentalists on the impact of such destruction? 3. Has Ramachandran Kadannappalli received any `go ahead’ signal from the people of Tamil Nadu to destroy their hill? 3. Has Ramachandran Kadannappalli made any study on the bio diversity of the oceanic belt affected by Vizhinjam Transit Harbour? 4. Is Ramachandran Kadannappalli aware that the implication of his statement is that the left front government will cause destruction of the only wedge bank in the seas surrounding India, classified as one of the twenty richest biodiversity oceanic regions in the world? 7. Does Ramachandran Kadannappalli have any idea of the environmental impact of reclaiming the sea for the construction of the harbour and the construction a four kilometre long break water inside the sea, a region which has strong waves especially in the monsoon season, waves lashing out from north to south and returning to invade the coast for several kilometres? 8. Does the Honourable Minister have any understanding on the possible destruction of beaches and thousands of houses of fisher people who live on the northern side of the project? 9. Is Ramachandran Kadappalli aware that the project will affect the jobs of thousands of fisher people including the jobs of hundreds of mussel collectors from the ocean? How can the Minister assure a `Development which does not harm people’ as per the promise of LDF in the state elections? 10. Is the Minister aware that the rich sea food in Kerala is an important source of cheap protein for not just the fishing community, but also for those who live in the plains and a mega development project threatening the rich bio diversity intense region will also be a direct threat on the food security of Kerala for generations to come? 11. The ecological diversity of the region can be compared to a Silent Valley under the Indian Ocean, which is not sufficiently studied yet. But it is known that there are several threatened and rare species in these waters, the destruction of which is certainly not just a national issue but also an international issue. 12. Is Ramachandran Kadappalli aware of the possible shoreline changes on the northern side of the project? There are enough evidences that this area is already threatened by sea erosion due to many reasons during the monsoon. The fisher people whose houses get destroyed during the monsoon seasons usually complain that no Government and no politician takes interest in such situations. The news paper reports inform us that at least 150 houses washed away around the project area due to the recent rains which occurred on May 17, 2016. How can one expect a government which can not even deal with the destruction of 150 houses of fisher people, to deal with the destruction of houses of over two dozen villages in the north of the Vizhinjam after the implementation of the project? 15. Is the Miinister aware that the UDF Government and Modi Government have promised to meet two third of the cost that the agreement between the previous UDF Government and Adani on the project was for `No Returns for 15 Years’ and for `One per cent’ of the profits (if any) after fifteen years? Will the LDF be obliged to provide thousands of crores of rupees, Kerala’s environment, lives of people of Kerala and the revenue that is collected from the people of Kerala as `charity’ to Adani? 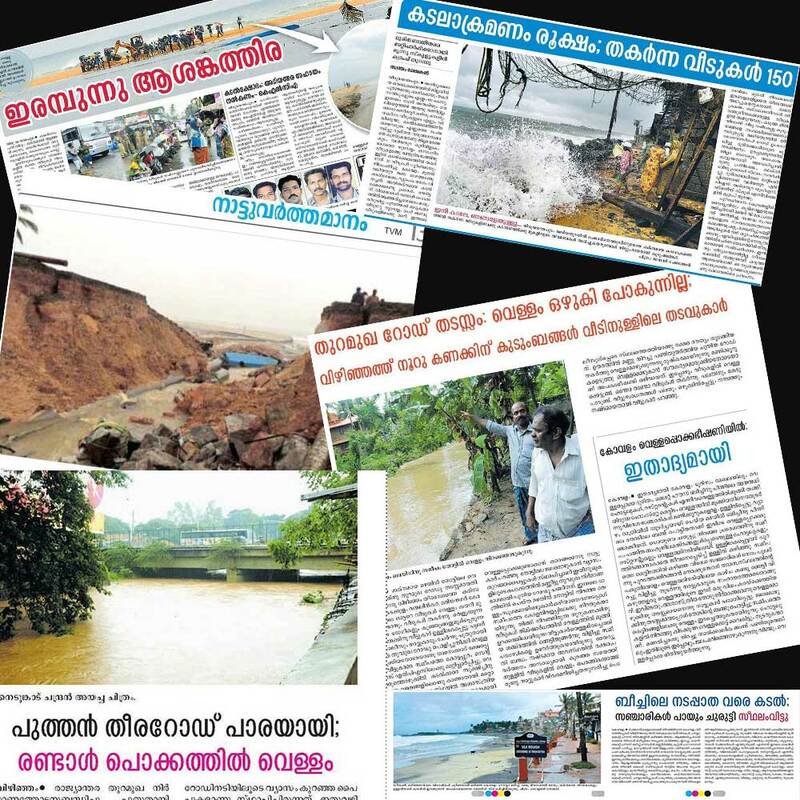 Has Kadannappalli forgotten the statement of Comrade Pinarayi Vijayan on May 16, 2015, saying that what is happening behind the development dreams of Vizhinjam Project is `Big Time Corruption’? What are the levels of potential corruption and how many times is such corruption more than any `Solar Corruption’ which the LDF has been talking about for such a long time? 16. What are the levels of compromises and corruption that the LDF will have to be responsible for in relation with the land mafia and the quarry mafia which are waiting for the execution of this project, propogating falsely that this project will convert Kerala into a Dubai or Singapore? 17. Kerala has already built a Transit Harbour in Cochin which is accepted as an economic blunder. Can the LDF Government afford to be responsible for a much bigger economic and ecological blunder, for the execution of a Transit Harbour just six hours ride from the first blunder? 18. Is Ramachandran Kadannappalli aware that the Honourable Minister of Finance, Shri Thomas Isaac, had already questioned the projectpublicly? 19. Is Ramachandran Kadannappalli aware that many organisations in Kerala, including Kerala Sastra Sahitya Parishad (KSSP), Kerala Swatantra Matsya Thozhilali Federation (KSMTF), Solidarity Youth Movement, Theeradesa Mahilavedi, Western Ghats & Coastal Area Protection Forum and many other diverse groups, writers and environmentalists have clearly spelt out their opposition to this project due to its social, economic and ecological impact? Has Ramachandran Kadannappalli discussed with all such organisations and the stake holders before undertakingarticulating such a public statement immediately after swearing in? Has Ramachandran Kadannappalli forgotten the basic principles of democratic discourses before making serious decisions affecting the lives of thousands of people and the environment? 20. As a Port Minister, does Ramachandran Kadannappalli know that the National Fish workers Federation (NFF) a forum of several organisations and trade unions of the fisher people all over India has taken a stand that `all commercial ports proposed must be given up. No more commercial ports, as already existing ports are underutilized.’ Has the minister undertaken any discussion with a body like NFF? If not, it may be advisable to study the implications of the project before making such opinions on a controversial project like this. Finally, there is something Ramachandran Kadannappalli should know. Vizhinjam Transit Harbour is Kerala’s Nandigram. The direct displacement may be much less than Nandigram, but the indirect displacement will be many times more than Nandigram. The environment implications of Vizhinjam Transit Harbour will be much more than any Nandigram. The economic burden for the people of Kerala will also be much more than any Nandigram. The left in West Bengal has not yet woken up from the loss of credibility which the state government and the party in West Bengal had to face after Nandigram. The Minister is certainly right in his observation about international and national significance of the project. But the significance is not on the false development dream of creation of a Dubai or Singapore in Kerala. The significance is on the precious character of the oceanic environment in this region which is already recognised internationally and this rich bio diversity is a national asset and internation. No Nandigram can boast of such an international and national asset. No Governments, led by the left or right should be allowed plunder nature – the asset of the future generations. No Government should be allowed to `own the seas, beaches and hills which belong not just to the past, present and future generations of the human race, but also to all species on this planet. The earlier the Governments realise that `they do not own nature, but they are only caretakers of nature in this planet’, the better. And reactions could be bitter otherwise! And I am sure there is a serious reflection within the left on the mistakes of the way development was viewed in the past. It is only through such reflections within the left that the LDF for the first time in its history came to face the election with a slogan: `Development Which Does Not Destroy the Environment’ and `Development Which Does Not Harm People’. I consider this as a major positive shift in the political agenda of the left in Kerala. I sincerely appeal to the Honourable Minister, not to play around with such significant dreams, even if there is no sufficient clarity on the routes to achieve such dreams as per the understanding of the left today. I also appeal to the Honourable Minister not to destroy the hopes which the people of Kerala have entrusted on the LDF through a sizeable number of votes, believing in the election promises of the Left Front. After all, even the Ministers are human beings who have come from this planet and destined to go back to this planet!